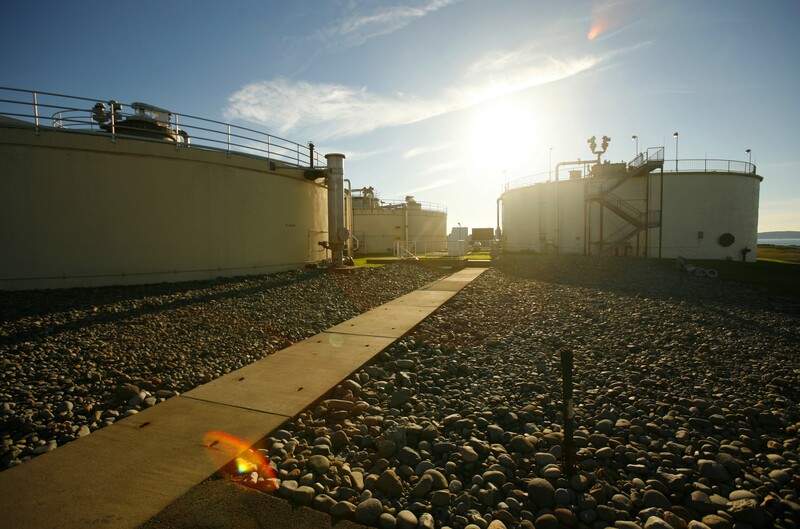 In 2001, a protective coating project was completed using a Polyurea coating to provide corrosion protection within the Chambers Creek #1 digester. 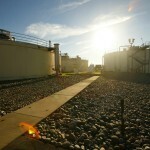 Within one year of the coating application, the polyurea coating was failing. A second application of a slightly different polyurea coating system was conducted under warranty to replace the failed system. 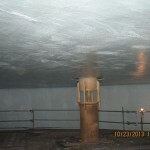 In 2003, during an inspection of the digester, the second application of polyurea was also failing due to very high levels of corrosive gases such as carbon dioxide, methane and hydrogen sulfite (H2S); therefore, a third polyamine coating system 40-50 mils thick was applied over an epoxy modified mortar applied perfectly smooth. The third coating system lasted longer than the first two coating systems but began failing after almost eight years in service. The third coating failure was most likely a result of the coating being applied to a surface that lacked a sufficient surface profile in order for the coating to bond, and the coating thickness was too thin for service in these environmental conditions. 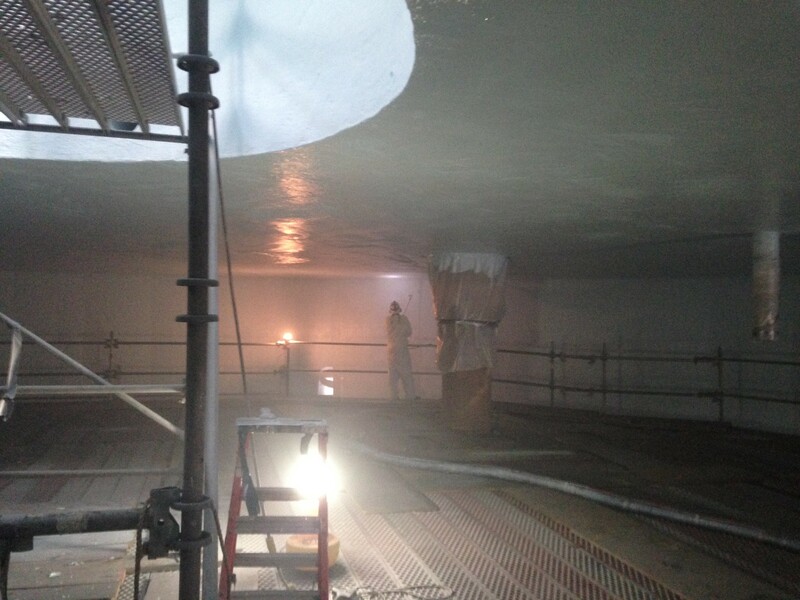 In 2013, Long Painting Company was contracted to rehabilitee the ceiling and 9”9” down the walls of the Chambers Creek Digester #1 using Raven Lining Systems 100% solids epoxy coating system, consisting of Raven 155 primer, Raven 405 Trowel to resurface rough areas, and Raven 405 FS for the finale 125 mil thick topcoat. The project started on August 26th, 2013 and was completed by November 12th, 2013. 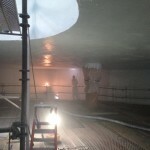 Prior to any failed coating removal and surface preparation work, the interior of the digester was pressure washed to remove biomaterial and surface contaminates. Reference ASTM D4258 – Standard Practice for Surface Cleaning Concrete, SSPC SP-13/NACE No. 6 – Surface Preparation of Concrete and ASTM D4259 – Standard Practice for Abrading Concrete. Most of the failing coating on the ceiling was already peeling off along with the majority of the coating on the walls. Once the remaining coating had been removed using power scrapers, chisels, and other tools, the concrete substrate was abrasive blasted in accordance to a minimum of an IRCI Concrete Surface Profile CSP4 and to provide adequate surface profile for the new coating system to adhere to. In some places where heavy corrosion had occurred, the profile exceeding CSP10. At all points which Raven Lining Systems 405 coating was applied to terminate a minimum of a ¼” wide X ¼” deep termination grove was saw cut into the surface of the structure at a slight angle. The coating system was applied into the groove filling it and slightly overlapping it. After all the blasting and preparation work was completed, the structure was thoroughly cleaned and allowed to dry. Once the structure was clean and dry, the coating application process commenced with the first application of Raven 155 water born epoxy primer at 8-10 wet mils. The purpose for the primer is mainly to reduce moister vapor transmission (air movement from the structures surface through the coating system). Although, it also increases adhesion. This greatly reduces the amount of holidays/pinholes in the coating system that will require repair after Holiday testing. After Raven 155 had cured for a sufficient amount of time and within the recoat window, the application of Raven 405 Trowel to roughly 3625 square feet applied at 95 mils thick on average was conducted. It was back rolled / troweled to fill all the voids, bug holes and level the rough areas. The resurfacing coat of Raven 405 Trowel was allowed to cure sufficiently and then the application of the Raven 405 FS began. Over 7995 square feet was coated with the Raven 405 FS at an average mil thickness of 135 mils. The reasoning behind the use of Raven 405 Trowel as the resurfacing product over cements and polymer modified cements was its increased ability to bond to the substrate along with much higher physical and chemical resistant properties. Also, the Raven coating system was on average 2 to 3 times thicker than the previously used coating system. The Raven coating system possess much higher physical / structural strengths, chemical resistance and permeation resistance, extending the service life of the coating system and providing longer structural protection. Once the coating had cured completely, a holiday test was conducted in accordance to ASTM D4787 – Standard Practice for Continuity Verification of Liquid or Sheet Linings Applied to Concrete Substrates or NACE SPO 188 Discontinuity (Holiday) Testing of New Protective Coatings on Conductive Substrates The test was conducted over all coated surfaces to locate any pinholes or voids in the coating system. Any areas that a holiday was found during the test or areas that appeared to visually be a holiday were repaired to ensure that a monolithic coating system covered the substrate’s surface. Adhesion testing was also performed in accordance to ASTM D7234 – Pull-Off Adhesion Strength of Coatings on Concrete Using Portable Pull-Off Adhesion Testers. Thirty-nine dollies were placed, and pull testing was conducted. A minimum range of 250-500psi was required for a successful test. Five of the 39 dollies were excluded because of a glue failure. All other dollies exceeded the minimum PSI range, in which the tests were stopped to prevent damage to the coating system. 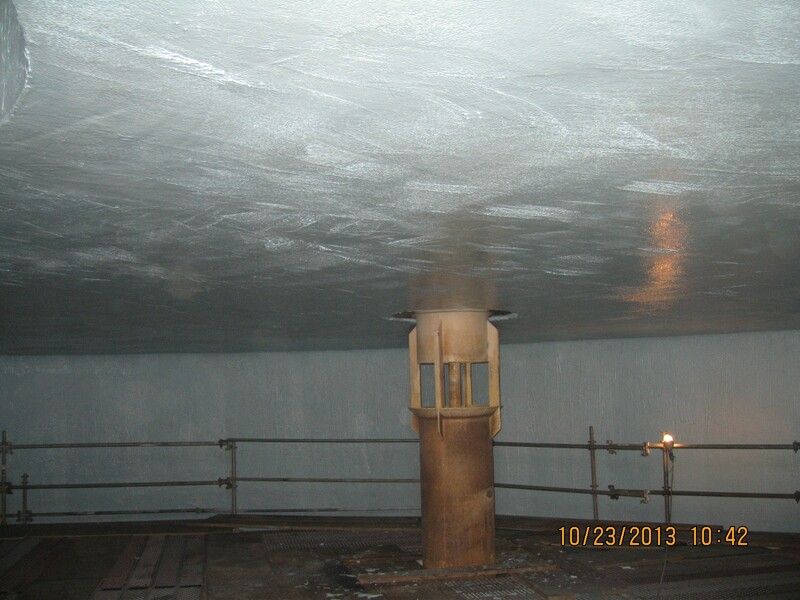 In February 2016, Jeff Roscoe with Pierce County was contacted by Raven Lining Systems to check on the coating systems’ performance and condition. He applauded that Pierce County could be used as a continual good reference and they are very happy how the project went. Also, they have not had any problems after three years in service with the Raven Lining Systems coating.